The U.S. Constitution protects all people living in the United States, regardless of immigration status, with certain rights and protections. Using the household window curtain format, Aram Han Sifuentes appliques messages to authorities (such as police and I.C.E.) and messages to neighbors of basic constitutional rights to protect themselves if such authorities show up at their homes. This new series of textile works by the Chicago-based artist translates these rights into various languages commonly spoken in the US, and translates a soft barrier into safe shelter through words and pronouncement of our civil rights. Aram Han Sifuentes uses a needle and thread as her tools to examine immigration, citizenship, race and craft, drawing on both personal experiences and shared cultural identity. 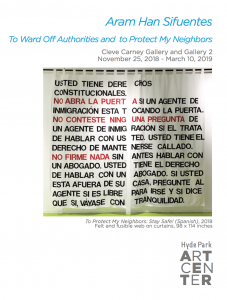 During the 2018 summer, she participated in a residency exchange program organized between Frise (Hamburg, Germany) and Hyde Park Art Center, where she began the Messages for My Neighbors project. Aram Han Sifuentes (b. South Korea, 1986) is a fiber, social practice, and performance artist who works to claim spaces for immigrant and disenfranchised communities. Her work often revolves around skill sharing, specifically sewing techniques, to create multiethnic and intergenerational sewing circles, which become a place for empowerment, subversion and protest. 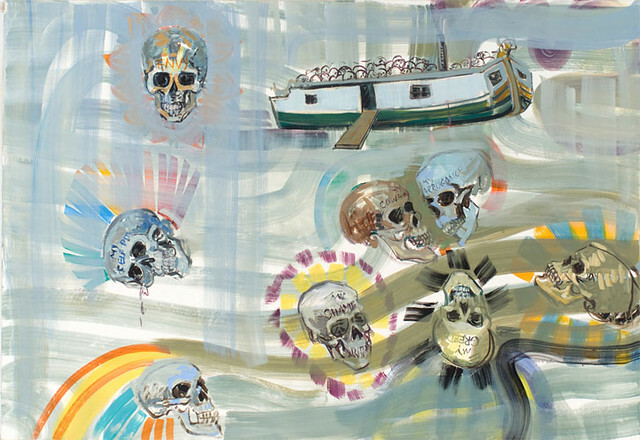 Since receiving a MFA from the School of the Art Institute of Chicago in 2013, she has shown her artwork and performed at the Jane Addams Hull-House Museum in Chicago, Illinois; Chicago Cultural Center in Chicago, Illinois; Whitney Museum of American Art in NYC, New York; Museum of Contemporary Art, Chicago; Wing Luke Museum of Asian Pacific American Experience in Seattle, Washington; Chung Young Yang Embroidery Museum in Seoul, South Korea; and the Centro de Textiles del Mundo Maya in Chiapas, Mexico. Aram is currently an Artist in Residence at the Pulitzer Arts Foundation and a Sponsored Artist at High Concept Labs in Chicago. Her prior awards include being a Smithsonian Artist Research Fellow, 3Arts Awardee, and BOLT Resident and 2015 BOLT Mentor at the Chicago Artists Coalition. She is currently an lecturer at the School of the Art Institute of Chicago.